John Wyre, one of the founding members of the world renown percussion ensemble NEXUS, passed away on October 31, 2006 in St. John’s, Newfoundland, Canada, after a long illness. He is survived by his wife Jean Donelson Wyre. Born and raised in Philadelphia, PA, Wyre played in the All-Philadelphia Senior High School Orchestra, studied with Fred D. Hinger (Timpanist with the Philadelphia Orchestra at that time), and became involved in Alan Abel’s Settlement Music School Percussion Ensemble (where fellow NEXUS members Bill Cahn and Russell Hartenberger would also play). John then went to Rochester, NY to study with William Street at the Eastman School of Music (which would also be the alma mater of another future NEXUS colleague, Bob Becker, as well as Cahn). After leaving Eastman, Wyre played with the Oklahoma City and Milwaukee Symphony Orchestras before becoming the Timpanist in the Toronto Symphony Orchestra, a position he held for eleven season between 1966 and 1981. 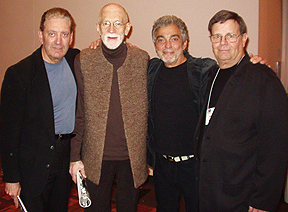 In 1968, he joined Becker and Cahn, along with Robin Engelman (with whom John played in both the Milwaukee and Toronto orchestras), and Hartenberger at the Marlboro Music Festival in Vermont and three years later these five musicians gave their first performance as NEXUS. (The late Michael Craden [1941-1981] was also one of the founding members of the ensemble). John Wyre’s life was hanging out with his friends and making music.. I had the distinct honour of spending a week or so at a music camp with Mr. Wyre in the summer of 1994. Being able to discuss music (although I mostly listened) with this man was a delight and something I will never forget. My deepest condolences to all of Mr Wyre’s family and friends. Play on, John, and thank you for all you did!